The JupiterJack is the must have product of the year. Ever forget to bring your cellphone headset? Is it illegal in your state to talk on the phone while you drive without a headset? 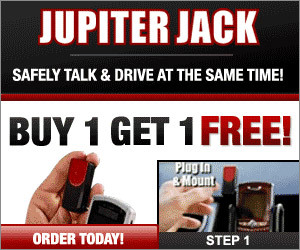 Then keep the JupiterJack in your car. How it works is that you attach it to your cellphone and turn your radio to 99.3FM. JupiterJack will use your car speaker as your headset! For a limited time, you’ll also get a free car dash mount and you can get another 1 for FREE! * No Plugs. No Wires. No Hands! * Works With Any Phone In Any Car. * Transmits Quality Sound Through The Speakers In Your Car.